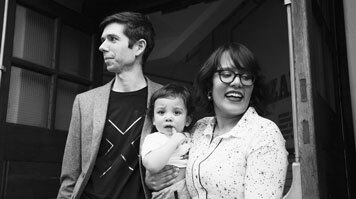 Becoming a parent was the inspiration for Sarada Chunduri-Shoesmith’s brilliant Wake Up Gigs concept, and led to the then postgraduate student winning the Idea Category of LSBU’s Make It Happen Competition in 2017. Wake Up Gigs allows parents to experience gigs and live music in a relaxed and welcoming environment, and has been featured on Lauren Laverne's BBC Radio 6Music show. The gigs run on Sunday afternoons, feature live acts and aim to make it as easy as possible for people to bring their little ones along. Attendees at shows so far have varied in age from 4 weeks to 66 years old! So, just how did this idea come about? “Well, my husband Adam and I became parents just over two years ago and we were always on the lookout for interesting things to do with our son at the weekends,” Sarada explains. “There’s a growing industry of cultural events you can take your baby or child along to such as baby cinema, baby Broadway, baby yoga and baby raves, and it was on the way home from a baby rave that we had the idea of putting on something similar based on our own musical tastes. We naively said things like: "How hard can it be to do that but add some live music into the mix as well?" As a couple, Sarada and her husband met through music and live music has always been their biggest passion. There is no doubt, however, that, like many other new parents, having a child sees lots of barriers being put up to continuing that passion. “We were sure there must be other parents out there who felt the same, so we set off to discover if that was true,” she reveals. Sarada says that the chance to take part in the Make It Happen competition was a great turning point, and made them think long and hard about what they really wanted for the business. “Not only that, but it helped us hone and communicate the message to our audience. It was also a great confidence boost to have the positive endorsement and recognition that the award brought. If anyone else has the opportunity to take part in something similar, I’d definitely recommend they go for it,” Sarada adds. “Regardless of how far you make it in the competition, the framework and business canvas process of the competition focuses your thinking to really understand how you can turn something from idea to business.